Although it's struggling to catch up in terms of general accessories, when it comes to locks, there's not a lot Kensington can do better. With its T-bar mechanism generally accepted as the de-facto standard for physical PC security, the relevant slot spread around the majority of the world's PCs, and a price point that can't be argued with, is there really any reason not to choose a Kensington lock? No. Unless you've already come up with a more sensible security method, like hiding your laptops in locked cabinets. 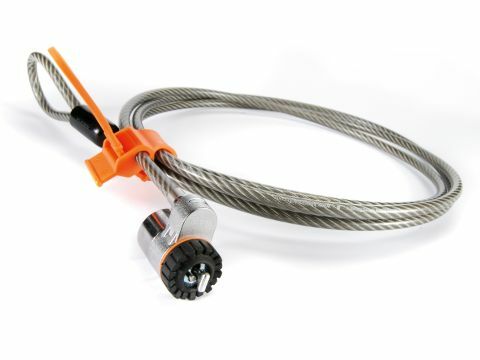 The construction isn't easily faulted, with a cable made of 4.5mm steel composite - carbon tempered, no less - offering secure yet flexible tether. This will be left looped long after any desk you might attach it to has been tugged to pieces. And the 'Tbar' locking mechanism is stronger than it might seem, enabling us to pick up one particularly hulking laptop and fling it about without any fear of breakage, and all without the svelte lock blocking any important ports or ruining the fl at base of the laptop. Despite its toughness and security, though, the Kensington lock is as much of a deterrent as anything else. If one laptop is locked up and another isn't, your casual thief probably won't go to the effort of unhooking the Kensington lock from whatever desk leg it's been wrapped around. They're not totally unbreakable, but circumventing one certainly wouldn't be an easy or quick task. And that's really all that's required at the end of the day. For businesses, Kensington offers a number of solutions that make rolling out the lock over a large scale slightly more attractive. You can implement different levels of keyed access, giving administrators access to all locks but section heads access to only those in their area, for example. This, however, is just another feature in a world where Kensington has little competition. It doesn't need to sell us on multi-key systems or carbon-tempered cores. Is it a metal loop? Yes. Can you hook it around a table leg to make your laptop a less attractive target? Yes you can. Is it tougher, more sensibly designed and much better value overall than similar attempts at security from folks like Belkin? Yes it is. Sold.